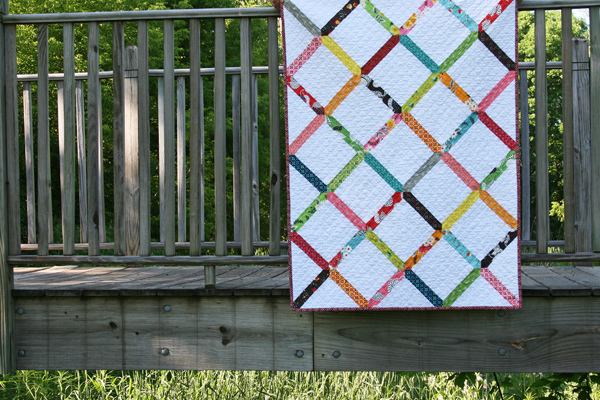 This quilt is a marriage of two loves – string quilts and Flea Market Fancy. It’s also one that I’ve wanted to make for ages… ever since my first string quilt. I think I might have been under the impression that it was too easy, so I never bothered, but you know what? Sometimes you want a nice easy project. Instant gratification is a good thing from time to time, right? I decided to cut into my Flea Market Fancy stash for a queen sized quilt for our bed. I used the same string quilt method but rather than using the white strip through the center of each block, I used a wider strip of one of the FMF prints. Then I bordered each strip with solid white. I really love this simple, clean look and the way it really highlights the FMF prints. The other nice part is that it didn’t use a ton of flea market fancy, while still giving the look of a flea market fancy quilt. I’d really like to do some straight line quilting on it – to add a bit of a pattern to those solid white squares – though I’m totally afraid of how long it might take! I made up a baby version just so I could test it out (same pattern, but slightly smaller starting block size). And it turns out that I do love the quilting, but it really took some time, even on this baby sized quilt.Â I’m not sure if I have the patience to do the same sort of quilting on a queen/king sized quilt! Anyway, the back of this one is a nice solid green, with a hint of the lattice pattern (or maybe an “x marks the spot”). I really love the pattern the quilting creates on the back! Now that I see this one done, I really want to get that larger one done! (though to be honest, the thought of all that work makes me want to set it aside and work on something else instead!) Hope I’m not the only one daunted by quilts of that size! This entry was posted in [search] String Quilts, 2010 Finished Quilts, Finished Quilts, Posts about Quilts, Quilts and tagged baby quilt, denyse schmidt, flea market fancy, handmade, modified string quilt, queen sized, quilt, quilting, straight line quilting, string quilt. Bookmark the permalink. Try setting a goal of quilting one white strip per day – that way you won’t get tired of it too badly, but that way, you should have the quilting done in less than three weeks (if my counting is correct!). And you can work on other stuff at the same time! Beautiful quilt, by the way! Ooh, I love it! 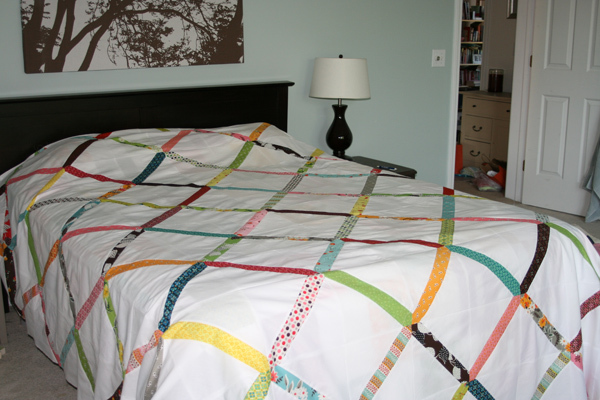 Great way to flip a string quilt on its head, and excellent way to show off a favorite fabric. All that straight-line quilting can be SO tedious! I just did some on my son’s toddler-bed-sized quilt, and even though it only took a few days, it felt like forever. So worth it in the end, though. Pushing a quilt that size through your DSM is daunting. Maybe you should send this one to long-arm quilter. However, there is a technique for quilting on the diagonal so that you never have so much under the arm. It is described in this book. 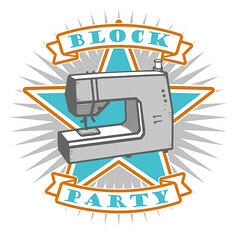 http://tinyurl.com/32rdemj I’ve used it on smaller quilts, and really like how it works. Forgot to add, I love the look of the quilting on the smaller quilt. It would look great on the large one! they are both absolutely beautiful, ashley! These 2 quilts are fantastic! I love the simplicity of the pattern! Wow! I really, really love those quilts and that quilting is absolutly the perfect choice for the pattern. I stand inspired! Gorgeous! One lucky baby and one lucky couple! It’s so crazy that you posted this because i was JUST thinking about string quilt variations like this the other day. I’m so glad to see it results in a BEAUTIFUL quilt. Something like this might be in my quilting future! 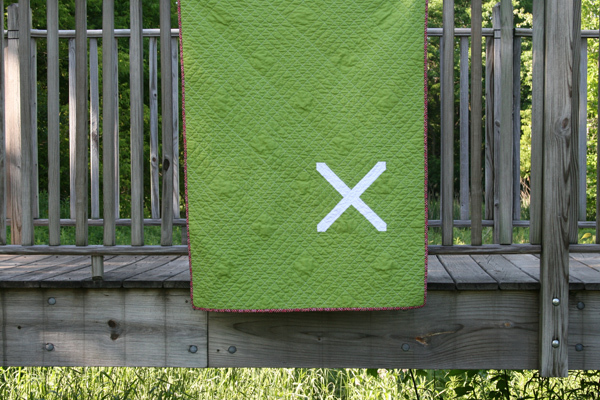 I totally love the whole thing…the pattern, the quilting, the ‘x marks the spot’ (ingenious!)!! I think you should repeat it all in the large quilt. I know it’s a lot of work, but if you do bits at a time…thinking you will be so happy when you’re done. Wonderful work, as always. I love it! Maybe you should send the big one out to be quilted since it’s so time consuming. It certainly would be worth it, its beautiful! It’s gorgeous! I would probably still do the straight-line quilting…with the gridded design, it would be pretty easy to divide into manageable chunks so that you wouldn’t get too bored. If it were me, having seen how good that baby quilt looks, I would probably regret doing something different on the queen size version. And it’s worth it–it’s FMF! Of course, I have never even thought about quilting a queen size quilt at all, so I might be aiming too high on your behalf! Whatever you decide, it will be lovely. I do love the quilting on the baby sized quilt. And LOVE the X on the backside! This is great – I’d just been considering a light summer quilt for my own bed, though I don’t have stash of FMF to devote to it. The straightline quilting looks great, though daunting too, to think about doing. I’m just a little bit crazy about that baby one – so fresh, cute and lovel the quilting! Great quilt! I like the simplicity of it. And that X on the back is so cool. It’s gorgeous, Ashley! I love your ingenuity! Love the straight line quilting on the baby size. It looks so great! Love the FMF, love the white, love how it looks on your bed! Great design. But that quilt is so dang cute! I too love the look of the quilting lines. Were it me, I would just do a few lines a night, while working on something else… so I didn’t get to the point where I was too sick of it! What absolutely gorgeous quilts! I love Flea Market Fancy Fabric, and have been hoarding what little I have for months now. :o) And I can’t imagine the time it would take to quilt the queen-sized quilt like the baby quilt, but goodness – it will be worth it!!! They are both beautiful!!! The first quilt I made was a queen size quilt for my bed. I think I must have been nuts for starting out on such a large scale. I was a little too ambitious so when it got time for quilting, I wimped out and only did stitch in the ditch. I really wish I would have taken the time to do something else with it, especially since I see it everyday. Your string quilt is beautiful! I really love simplistic design. It makes the FMF really pop! I LOVE this pattern! Would you be willing to give a few more details as to how you put the blocks together? it’s perfection! and the X on the back – its the piÃ¨ce de rÃ©sistance! It looks a million times better quilted. You’ve got to do it! Gorgeous! I would love to hear more about what technique you use to keep your lines so straight. My last attempt at straight line quilting resulted in a lot of seam ripping. No, you’re not the only one daunted by the size, but now you have the sample in front of you to give you a hunger for the finished bed quilt ! Don’t skimp at all ! Do it just like that…….you’ll be so disappointed if you take any shortcuts. It’ll be so well worth the work, and still so much quicker and less work than the old days when you would have had to sit and quilt every little bit by hand ! That sample is outrageously gorgeous. That baby quilt is just too cute. And when I scrolled down to see the back, I just laughed out loud. What a fun surprise! I have just begun using straight line quilting on some smaller tops, and it DOES seem to take just forever. When I think about breaking it up to do another project in between, that one UFO just sits on my conscience. I also use my home machine, so I checked out that book with diagonal quilting mentioned up above. I found it for $1.50 at Amazon, so it’s on its way to me as I speak. That has always been a big problem, no matter what kind of quilting you’re doing. i love it and the quilting…do you use a quilting guide when you do the straight line like that or tape? how far apart are the lines? That quilting looks gorgeous! It will take forever, but it will be so worth it. haha – I have a queen size that has been waiting two years to be finished…I think I’ll have to send it out to get quilted….. Absolutely love the quilt! What a great variation of the string quilt! Brilliant! This is a great pattern for a queen size. I love how you reversed the string block with the print in the center and white on the outside. Nice effect! I also love that quilting on your mini version. I’m betting you will be happy with the results after all your effort. I’m the opposite – I hate working on small quilts, because my favourite place to see a quilt is on a bed, and I know if it’s small it’ll never make it onto a bed! WOW! 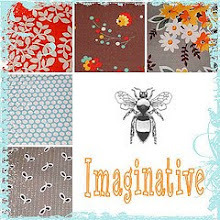 Very striking quilt – love it and you are talking to the queen of instant gratification! And now you know why all my large quilts go straight to the long arm quilter!! 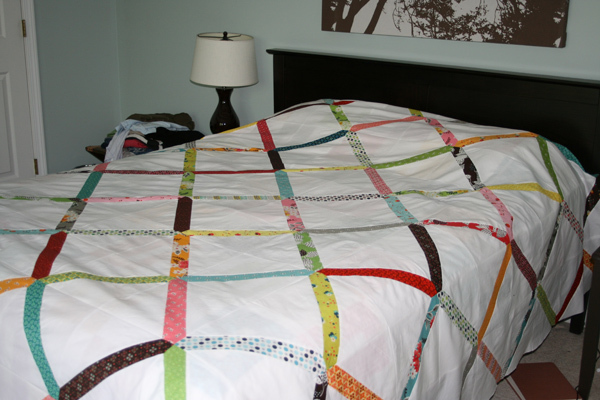 What a genius idea for a string quilt! I love it! I love this quilt! Are you able to share the quilt block sizes…I’m new to paper piecing. the quilting is amazing. i love the pattern. so simple, so effective. You know Ashley I always love your quilts but I have a constructive criticism to make of this one. I think the smaller block size works really well but my feeling is that the larger one has too much white space and need some fancy quilting inside the block to lift it. The smaller one is gorgeous, I’m just a little worried that the larger one may look a little flat unless picked up by the quilting. I’ve never made a queen sized quilt. I don’t know how I’d put it under my machine. Quilting will look lovely on it. Good luck! I love it. I have been considering something similar for a throw size. I am glad to see your example. It’s beautiful Ashley. I said I wouldn’t do it for a long time, but I’m cutting into my FMF again too! Temptation is just too strong! The quilting looks awesome on the little version. They go together like PB&J! You might have to do it on the bigger one too. I can’t even picture a different quilting pattern/design. I love this! Such a simple pattern, but the quilting sets it off. It makes me want to sew one for myself. Beautiful! The quilting on the little one is just simply elegant. Beautiful job. Makes we want to race into my sewing room and sew! I love this one! You truly are a prolific quilter. Every time I look at your blog you made another quilt–impressive! I love how you reversed the kaleidoscope quilt – this is another beauty! The FMF fabric is so powerful, it looks good with a big portion of white… Brilliant design, Ashley! Absolutely fantastic! Brilliant design, love the simplicity! Love these quilts! The baby one looks so sweet quilted, I wish I had made them myself! How big did you make the blocks? And how big is the centre stripe? Absolutely gorgeous. I adore everything you make Ashley, you know that….but this one truly takes the cake!! absolutely amazing!!! the FMF really pops and the design is simplicity taken to the next level!! I love the way the quilting on the smaller version frames the design and agree that it will be so worth the extra work to do it on the larger version. Now I wish I hadn’t cut all my FMF up to do hexes!! I love staring at your quilts to figure out how you construct them. Beautiful job on both. The quilting is fantastic. Painstaking but fantastic. 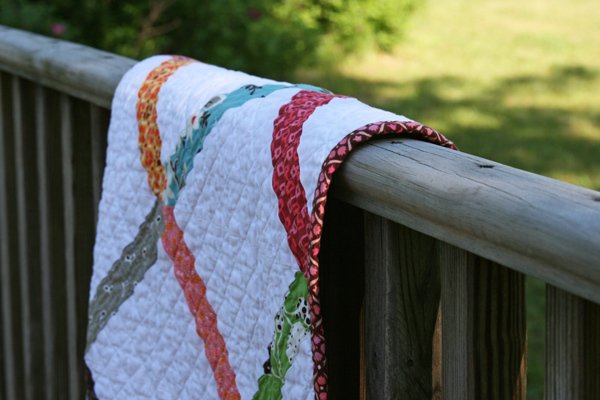 Love the quilting on the baby size Ashley – it really makes those beautiful flea market colours pop! I’m still daunted about finishing my queen size quilts (note plural – eek) let alone quilting one of them – Congratulations on getting that far! Simply gorgeous….. and I love the “X” on the back! Oh, Boy! The quilting is just perfect and adds more drama than I would have imagined straight-line quilting would do. Nicely done! How clever is that quilt – genius! Your brain must work overtime with your fingers catching up to quilt! Well done, I can’t believe how simple and wonderful this pattern is….you’ve sparked a myriad of inspiration…again! Nicely done, Ashley! I have been eyeing this, too, ever since first seeing it on Lisa’s (of Shiner’s View) blog. Now I KNOW I will have to do this! I’m wondering how many strips will this take; will my honeybun be enough? what type of machine do you use to quilt with? ALL your quilts are beautiful. Beautiful and the cross hatching/straight line quilting is fab. Have you thought of having someone else quilt the large one? Feathers in all the beautiful white space would look so nice (being a longarm quilter myself, I love feathers). Just a thought. Hi Ashley, I’m new to following blogs, and love yours. This quilt is beautiful. You added the link to your string quilt tutorial but wondered if you could explain how you made these blocks, I’m having a little trouble figuring that out. Thanks for an inspiring blog. I found your website this summer and love your creations. My favorite names are the 3 young men in my life, Ryan, Logan, and Peyton. Happy New Year! I’ve made a string quilt before so I’m familiar with the process, but I am having trouble figuring out how you did the reverse. Did you use paper piecing? Did you cut out a triangle to sew on either side of the middle strip? How did you square your squares? Thanks ! I my gosh! this is so adorable – just found out I am going to be a grandmamma – Yippee!!! where can I find this quilt pattern? I have never done a string quilt method but will give it a shot. Pingback: A short history of modern quilting, plotting and suggestions needed for baby loot.